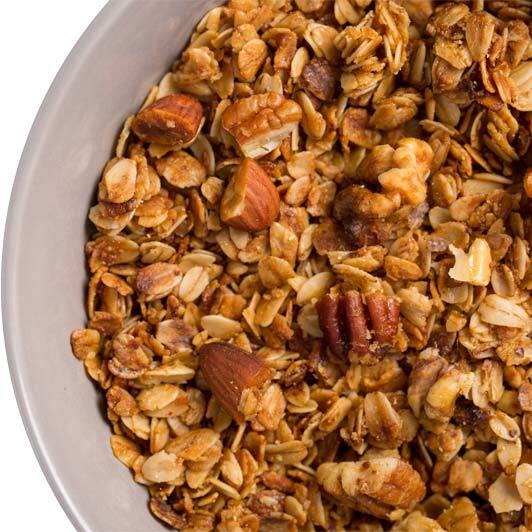 Our Nutty granola has almonds, walnuts, and pecans. But almonds are the real key to this flavor. We tried whole almonds, slices and bits – and finally we took whole almonds and cut them in half. It really seemed to make a difference. But talk about a lot of work! Luckily, the walnuts and pecans already come halved. This is a hearty granola with a really great nutty flavor. For all you athletes, those almonds make this a great recovery food after a heavy workout.